This transgender bathroom situation is a wholly manufactured problem. There is an implicit social contract when we use the restroom; we assume we’re all there for the same purpose, and no need to ask for birth certificates. It never crossed anyone’s mind to be concerned because there was no reason to be concerned. But the North Carolina legislature poked a hornet’s nest, and now we’re all getting stung. Transgender people are not pedophiles. They don’t have a sexual perversion. They were born in one body and have neurons and such wired for a different body. Or something science-y like that. I myself feel like a tall blonde inside and am shocked each and every time I look in the mirror and see a short redhead. Also, I walk around all the time imagining that I have a waist. Don’t ruin it for me. Why do I care if Jane, in the stall next to me, used to be John? Exactly in what way does that affect me? For all you know, I used to be Joe; it doesn’t change your opinion of my blog, right? We all grudgingly agree that it is occasionally semi-humorous whether I’m Jill, Joe or a space alien. No further comment on that by the way. Public restrooms are disgusting because people are pigs. Other people. People we presumably don’t know, who don’t care about those who follow in their, umm, footsteps. I am much more concerned about whether or not a person washes their hands after using the restroom than I am about what parts they are sporting. Anyone, transgender or not, could be kind enough to tell me when my skirt is tucked in to my pantyhose or when I’m trailing toilet paper on my shoe. Yet no one ever is kind enough. I have learned though, that when people are pointing and laughing at me as I exit a public restroom, it’s likely there’s a problem. I’m not saying it happens a lot, I’m just saying it happens enough that I learned my lesson. Your kid is something like 100X more likely to be sexually assaulted by someone they know than by a stranger. This is completely true; I was just too lazy to look up the actual percentage, which is probably a lot higher. A bigger number than my brain can process cause it stops at 100%. It is endlessly annoying that transgender women typically look better than me; more put together. No runs in the pantyhose, make-up that stays put, perpetual lipstick. Let’s start making some laws about that. 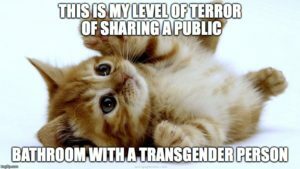 Do you think that transgender people, who have probably been suffering their entire life what with being in the wrong body and all, are looking for more trouble? Because telling everyone they know that although they were born male (female) who they really are is female (male) isn’t painful enough? I once had no choice but to tell my mom that I flunked 10th grade PE, and I would be mortified if the whole world knew! I’m guessing working up the nerve to tell folks you are transgender is just a tad bit tougher. Nearly everyone who was ever a teenager has gotten drunk and peed on something or other outside, while trying not to pee on their jeans, even though they are laughing hysterically with their girlfriends who are doing a terrible job of standing guard. I mean, that’s what I’ve heard. If you got through that you can get through the immense trauma of not knowing the anatomy of the person in the stall next to you. People seem to be very confused about what transgender means. So check out this HRC glossary. You will learn that transgender people are not big hairy, scary men in skirts waiting to harm someone. I, however, haven’t shaved my legs this decade but I still use the women’s room. That should frighten you. My new most favorite person in the world is comedian Trae Crowder, the Liberal Redneck. He has additional salient points. Caution: lots of adult language and other potentially offensive stuff (another reason I love him). This entry was posted in Uncategorized and tagged Childhood, Culture, Drama, Irreverent, Politics, Stupidity. Bookmark the permalink. 16 Responses to WTF Wednesday: Why Is Everyone Worried About What’s Under Someone Else’s Dress? I am a tolerant, open-minded person except when it comes to intolerant and close-minded people. Great blog and I LOVE Trae Crowder! I know, I have to remind myself sometimes to be tolerant of those who aren’t tolerant! Awesome post, Jill! I just don’t get it ~ what, really, has changed? We’ve always shared public restrooms with the gay, lesbian and transgender population. So what? You are right ~ I’m much more concerned about whether someone in a public restroom washes their hands. Nothing has changed, just creating a problem where there wasn’t one! The whole thing is silly. Poor Dan, having to deal with hairy legs. Seriously though, I find it hard to comment on the issue. My words fail me. Thank goodness for your blog, Jill. People would say this is a first world country problem. I expect some countries down have bathrooms and people of any gender squat in back of bushes or something. Love the video. That southern brawl made it even more hysterical. Just be sure to carry your birth certificate with you from now on just in case you are stopped by the potty police. This is absolutely a first world problem!! And the rest of the world, developed or otherwise, probably think we’re pretty silly. And…they are absolutely right! Let’s just make one big unisex bathroom! Stalls for everyone and one long line winding around the block. That would make for equality, men would have to wait a long time just like women. While I understand that news is a product, and the media manufactures news, but why are we buying into such nonsense? Yes, and there are several instances where female friends of mine walked right into a men’s room at a concert because it’s the only way they could get to a toilet! Of course, my friends aren’t the classiest group. But they’re mine! You’re one of my most favorite people in the world, Jill.